Shown above is a circle with a random point P selected. The main principle we are going to solve this question with is that the a tangent to a circle is perpendicular to a line drawn from the center of a circle to the point of contact. With that in mind we start by joining the center to point P and extending it on. We know that the tangent will be perpendicular to this line, so what we do is take distance OP on our compass and swing from point P and where it cuts the line you previously drew will create point A. 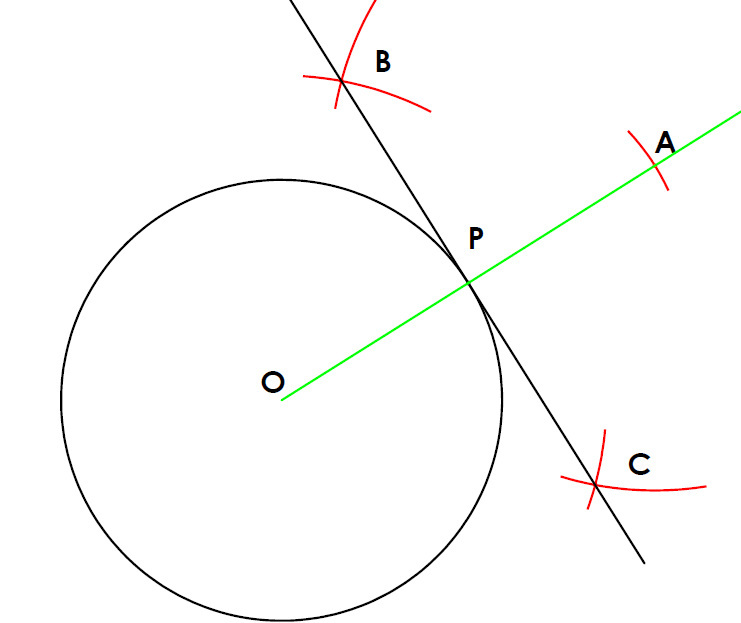 Next we are going to bisect line OA and the resulting bisector will be a tangent at point P because we know that distance OP and distance PA are equal since they were drawn with the same radius. Move point A to change the position of the center point of the circle. Move Point P to change the position of point P and also the radius of the circle. Notice how the line drawn from the center of the circle to the point of contact will always remain 90 degrees to the tangent.